When American cowboys of the 1800’s ran cattle together on open ranges, they gathered each year to separate their herds from their neighbors. This is what we call “Cutting”. Naturally, when you bring a group of people working together it turns into a competition, and Cutting Horse competitions are some of the best. The Cutting heritage runs strong and deep, and has for centuries. In the 1800’s it was also a grand social event and nothing from that has changed much today. The ranchers gathered, there was a Cutting competition and the families shared their stories and wares from the last gathering. They revealed crafts, sold wares, exchanged recipes, but most of all, they shared laughter. They worked side by side to teach and guide their children and developed a strong community. From this we have seen many “Legends” in the Cutting industry that give us inspiration to keep this sport going. With technology and advancement we no longer run herds together, and most of the gathering and sorting is done with pickup trucks and squeeze chutes, but the social heart of where cutting began, lives on in all of the people involved, and it is so strong that it will live on for many more generations to come. 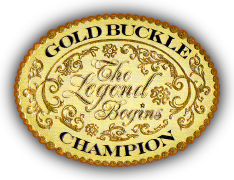 This is the goal and inspiration for Gold Buckle Champions, every year with our events.